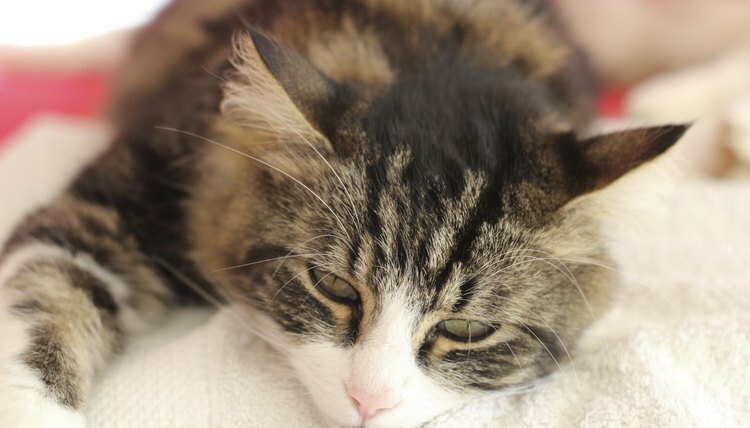 Intestinal parasites, commonly referred to as "worms" in cats, can cause your feline friend to become very sick. Several types of worms commonly infect cats, including roundworms, hookworms and tapeworms. These parasites can even make humans sick in some cases. Your vet can diagnose what kind of parasites your kitty is suffering from and prescribe a medication to get rid of them. The most common intestinal parasite to infect cats is the roundworm, according to the American Society for the Prevention of Cruelty to Animals. These parasites resemble spaghetti. They can cause vomiting, diarrhea, weight loss, a dull coat and even an intestinal blockage. You might find these parasites in your cat's feces or vomit if she's infected. Roundworms live in a cat's intestines, where they lay their tiny eggs that are then expelled in the feces. If your cat ingests these eggs after contact with the feces of an infected cat, she too will become infected. She also can become infected by eating an infected rodent. Kittens can get roundworms from their mother's milk. Roundworms can stunt their growth and cause digestive upset and gas. Roundworms are zoonotic, infecting people if their eggs are ingested. Tapeworms are long, flat, segmented worms that attach themselves to your cat's intestines. These parasites are most common in adult cats, according to WebMD. If your cat is infected with them, you might find segments of these worms in her feces, which resemble small grains of white rice. These pests can cause vomiting and weight loss, but sometimes cause no symptoms at all. Like roundworms, tapeworms can stunt a kitten's growth or cause digestive upset. Your feline friend will become infected with tapeworms if she ingests an infected flea or another type of intermediate host such as a rodent. While some tapeworm species can infect humans, especially children, most don't cause serious illness. The tapeworm that can cause people to become very sick, Echinococcus species, is rare in the United States. Although hookworms are more commonly found in dogs, some species can infect cats as well. These pests live in the small intestine, where they feed on your cat's blood, causing anemia, blood in the stool, constipation, diarrhea, lack of appetite and even death if left untreated, especially in kittens. Their eggs are passed through a cat's feces, where they develop into larvae. Hookworms can be transmitted through the ingestion of the larvae in the environment or through skin contact with the larvae, which can burrow through a cat's skin. Kittens can be infected with hookworms from their mother's milk. These pests are zoonotic and can infect people by burrowing into their skin. Infections in people usually are limited to a skin rash. Bring your cat to the vet if you suspect she has any internal parasites. He can take a stool sample to determine which type of parasite she's infected with and prescribe a medication to eradicate it. While there are some broad-spectrum dewormers available, they won't all kill every type of intestinal parasite. Most deworming medications require more than one dose over time and are typically given orally. Follow your vet's recommendation regarding the dosage and frequency of administration. After your kitty is treated for intestinal parasites, she easily can become re-infected. Prevent your kitty from becoming infected again by keeping her indoors. Clean animal feces in any outdoor areas your kitty has access to and treat her with a flea control medication.